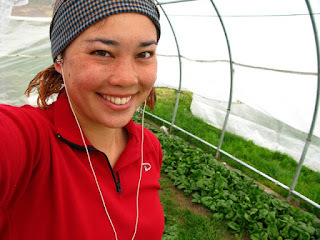 On Tuesday I harvested 23 pounds of spinach from two beds in one of our greenhouses. The Olympia spinach that Lucy planted on March 14th -- 2 days before my 24th birthday and the day I completed my first triathlon -- has been going crazy down there and many of the leaves were the size of Lucy's face, as she noticed as we washed it, spun it dry, and bagged it up. The bed behind me yielded about 10 lbs, and the one just to the left, another 13. Next week, we'll probably harvest the same amount from these beds, plus more from the other beds coming online. I already had a half-pound bag, plus some, in my refrigerator from the week prior, so with that plus a 1/2 pound waiting on the "house shelf" and 3 more beds coming online for harvest next week, I figured it was time to find a use for my spinach. 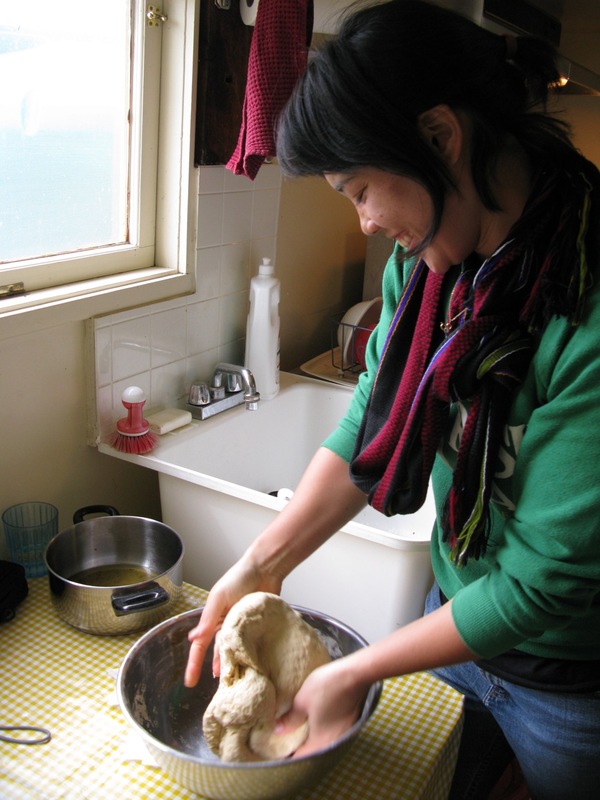 Last week, I rescued my garlic from a nasty green mold that overtook everyone else's stashes on the farm -- peeling and storing the good cloves and washing wholly untainted bulbs in hot water and refrigerating. I figured though, that this only bought me some time and I should use the garlic quick before it got funky. Heat oven to 375. Prep garlic by cutting off both ends of the bulbs. Put on a baking sheet and drizzle with olive oil. Throw in the oven. Cut up your spinach if it's huge. If it's little, don't worry about it. Heat your soup pot over medium with a spoonful of olive oil. While it's heating, take out your garlic. It should be pretty soft by now. Peel off the skins and throw the garlics into the pot. Your pan should be hot now and they should sizzle and smell like heaven. Once you've got those in, throw in your spinach and saute until wilted. Then add your stock and bring to a simmer. 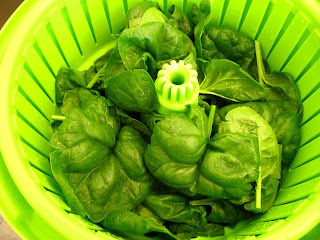 Once that's done, pulse the whole mixture in a blender a few times to break up the leaves -- I like a few chunks of spinach to remain. Pour the mix back in the pot, turn your heat to low. Stir it up, add your splash of nutmeg (I grated 1/4 of a fresh clove), salt, and pepper. Now back to those potatoes... they were little, so they're probably cooked by now. Take them out of the oven and add to your soup pot. Add a pat of butter and stir. After the washing station is wiped down with bleach, we fill up two large sinks with cold water. 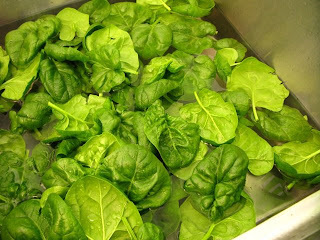 All the greens go through two washes where we get dirt off and pick out less-than-perfect leaves that snuck in to the harvest. We touch nearly every leaf. 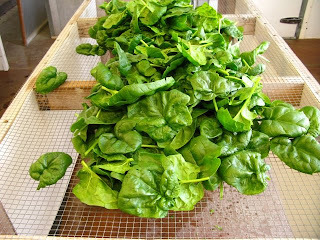 Greens are usually dried in the spinner, but our huge spinach leaves are extra fragile and are dried by gently tossing on an open mesh screen. 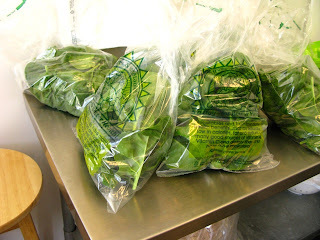 Clean greens are laid out on the table for weighing and bagging. Soon we'll be switching from plastic bags to something biodegradable. Cool! * RIP = Recipe in Progress. I love to improvise. There's nothing more satisfying than pulling together a delicious meal from randomness, but then you come up against the tragedy of never being able to recreate the felicitous arrangement of ingredients & preparation. This is an attempt to keep track of how I cook, improvements and substitutions.